Jaw Crusher is one of the most widely used crushing equipment in mining industry. It is mainly applied in the primary crushing in which the compressive strength of original material is under 320Mpa. It is equipped with simple structure, stable performance, easy maintenance, even final particles and high crushing ratio. Jaw crusher has been widely applied in mining, metallurgical, construction, road and railway building, water conservancy and chemistry etc. It is mainly applied in the primary crushing in which the compressive strength of original material is under 320Mpa. 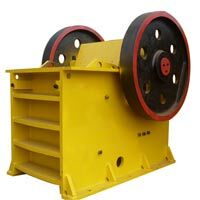 Jaw crusher is usually used in coal crushing and screening plants as primary coal crusher for crushing process. Click here to watch more pictures about Jaw Crusher! 1. Simple structure and easy maintenance. 2. Stable performance and low operating cost. 4. Use high manganese steel, one-off foundry. 5. High resistance to friction-abrasion and compression with longer operating life span. remind you to follow these basic maintenance,If pay attention to these, jaw crusher can better run and extend the life. 1. before the operation or maintenance of jaw crusher, make sure you have studied manual and received training in safe operation. To determine if the accident happens, you know how to turn off the machine. 5. Before the maintenance of jaw crusher machine, all electrical control devices and electric motors should be power outages, locked, and posted with maintenance of identity. 8. only responsible persons (whose name should be recorded) be authorized to remove the risk of identity, then you can do it.